Johnson rushed four times for 21 yards and caught one of four targets for three yards in Sunday's 26-24 loss to the Ravens. Johnson ran for 12 yards on two carries, adding six receptions for 54 yards during Sunday's 26-18 win against the Bengals. Johnson carried the ball four times for 28 yards and caught four passes on five targets for 25 yards during Sunday's 17-16 win over the Broncos. Johnson carried the ball twice for minus-6 yards during Sunday's 26-20 win over the Panthers. Analysis: Johnson's involvement in the offense continues to be nearly nonexistent. Sunday's contest marked the first game all season in which Johnson wasn't targeted as a receiver, and his rushing total also marked a season low. With rookie Nick Chubb continuing to dominate the snaps and workload, the 25-year-old back has just seven carries for 25 yards and six receptions for 66 yards over the past four games. Johnson (personal) doesn't carry a designation into Sunday's game against the Panthers after practicing fully Friday, Nate Ulrich of the Akron Beacon Journal reports. Johnson (personal) has rejoined the team Friday after missing practice the last two days, Scott Petrak of the Elyria Chronicle-Telegram reports. Analysis: An earlier report from Michael Silver of NFL.com indicated Johnson may not return in time for Sunday's game against the Panthers following the death of his grandmother, but that no longer appears to be the case. The Browns' official injury report should clear any questions on the 25-year-old's availability when it's released later Friday. 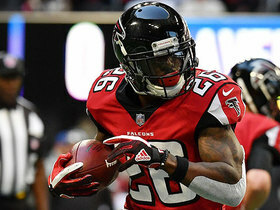 Johnson (personal) may not return to the team for Sunday's game against the Panthers, Michael Silver of NFL.com reports. Analysis: Johnson has been away from the team this week due to the death of his grandmother, according to Silver. The Browns' injury report should provide a better idea of his game status, but at this point, the 25-year-old's availability is uncertain. Johnson (personal) isn't participating in Thursday's practice, Scott Petrak of the Elyria Chronicle-Telegram reports. Analysis: Johnson will remain away from the team for a second straight day to address the personal matter, leaving his availability for Sunday's game against the Panthers tentatively in jeopardy. If Johnson rejoins the team for its final practice Friday, it would assuage any concerns about his Week 14 status. Johnson missed practice Wednesday for personal reasons, Scott Petrak of the Elyria Chronicle-Telegram reports. Analysis: Interim coach Gregg Williams is hopeful Johnson can return from the excused absence to take part in Thursday's session. It won't be a concern for Johnson's Week 14 availability unless the running back is still away from the team Friday. The Browns will play host this weekend to a slumping Carolina team that has been torched by opposing wideouts and tight ends this season while mostly holding running backs in check (105.2 scrimmage yards per game, 11 touchdowns in 12 games). Johnson wasn't in attendance for Wednesday's practice, Mary Kay Cabot of The Cleveland Plain Dealer reports. Analysis: It wasn't announced that Johnson suffered an injury during Sunday's 29-13 loss to the Texans, though it would provide an explanation for why the pass-catching specialist was limited to just 20 offensive snaps in a game the Browns trailed wire to wire. The Browns will release their first injury report of Week 14 later Wednesday, which will reveal whether Johnson's absence was health-related or merely a matter of rest. Johnson didn't record a carry and caught two of three targets for 12 yards during Sunday's 29-13 loss to the Texans. Analysis: The Browns rushed just nine times as a team Sunday, as the game script forced them to throw on almost every down in an attempt to make up a 23-0 deficit at half time. However, even though quarterback Baker Mayfield attempted 43 passes, Johnson saw only three of those directed toward him. Johnson was on the field for 35 percent of the offensive snaps, and his production continues to falter. He'll look to get more involved Sunday against the Panthers. Johnson rushed twice for 16 yards and caught one of two targets for 23 yards during Sunday's 35-20 win over the Bengals. Analysis: Johnson had seen his involvement and touches increase over the team's previous two games, but Sunday represented a downturn from that trend, as his three total touches were his lowest mark of the season. Meanwhile, Cleveland's lead back, Nick Chubb, was given 31 touches. Johnson's next chance to re-emerge on the PPR radar will come this coming Sunday against the 8-3 Texans, against whom running back Dion Lewis snagged seven catches for 33 yards in Houston's 34-17 win over the Titans on Monday. Johnson rushed three times for 15 yards and caught all four of his targets for 31 yards and a touchdown in Sunday's 28-16 win over Atlanta. 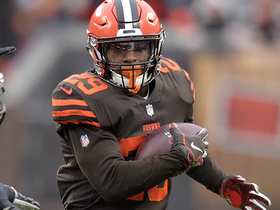 Analysis: Johnson has been the biggest beneficiary of the regime change in Cleveland, as he has three touchdowns in two games since Freddie Kitchens took over offensive play calling. Unfortunately for owners who recently picked Johnson up and want to use their shiny new toy, he'll be on bye along with the rest of the Browns in Week 11. Johnson caught all nine of his targets for a team-high 78 yards and two touchdowns in Sunday's 37-21 loss to the Chiefs. He also rushed once for eight yards. Analysis: With Gregg Williams in at head coach and Freddie Kitchens now in charge of calling plays, the Browns made a concerted effort to give Johnson the ball for the first time in 2018, evidenced by his team-high nine targets. 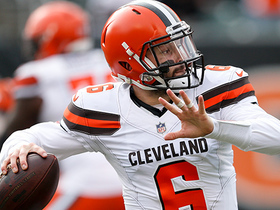 Johnson and rookie quarterback Baker Mayfield were in sync throughout Sunday's game, and Johnson accounted for both of Mayfield's touchdowns through the air. It remains to be seen if Johnson's level of usage will persist, but Sunday's performance finally gave fantasy owners hope. Johnson carried the ball twice for zero yards and caught two of three targets for 16 yards during Sunday's 33-18 loss to Pittsburgh. Johnson was stuffed for a loss of four yards on his lone carry of the afternoon, adding four receptions for 23 yards during Sunday's 26-23 loss to Tampa Bay. While Johnson is listed as the starter Week 7 in Tampa Bay, Mary Kay Cabot of the Cleveland Plain Dealer suggests rookie Nick Chubb will have a meaningful role as well. Analysis: The Clevaland beat writer referred to Chubb as the "workhorse" and clarified that Johnson may not be the first back on the field, nor get the majority of the carries. Fantasy owners can expect some type of split between the two backs, with Johnson known as the better pass-catcher, and Chubb likely the better traditional runner. Both will see a boost in value this week in the absence of Carlos Hyde, who was traded to Jacksonville on Friday. Johnson is listed as Cleveland's starting running back Week 7 against Tampa Bay, Nate Ulrich of the Akron Beacon Journal reports. 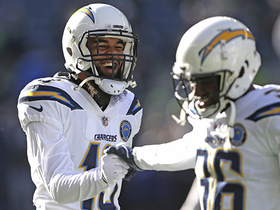 Johnson carried the ball twice for a team-high 36 yards and caught four of five targets for 73 yards during Sunday's 38-14 loss to the Chargers. Analysis: Johnson was finally able to get involved in the passing game Sunday, as his four catches matched a season high. He also managed to lead the Browns in rushing yards, despite just two carries. 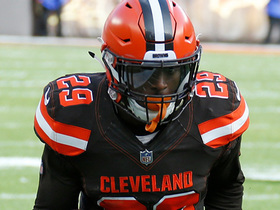 Johnson played 47 percent of the team's offensive stats, though coach Hue Jackson suggested rookie Nick Chubb could start cutting into his playing time, and if that does come to fruition, Johnson's fantasy value is likely to plummet even further. Johnson rushed five times for 35 yards and caught his only target for seven yards during Sunday's 12-9 victory over the Ravens. Analysis: Johnson was on the field for 51 percent of Cleveland's offensive snaps and had his most productive game running the ball, despite the limited involvement. His seven yards per carry was the most among Browns running backs, leaving one to wonder if he'll begin to get more carries moving forward. Johnson's lack of involvement in the passing game is still a concern, however, as most of his fantasy value comes from his ability to catch passes out of the backfield. Johnson rushed twice for 11 yards and caught four of six targets for 45 yards during Sunday's 45-42 loss to Oakland. Analysis: With Baker Mayfield at the helm, Johnson finally got involved in the passing game, posting season-high receptions and receiving yards. He still isn't a factor in the running game, and with Nick Chubb's impressive performance, Johnson's role could dwindle even further if the rookie running back continues to put up huge numbers. Johnson and Mayfield will look to continue to mold their connection in the passing attack Sunday against the Ravens. Johnson rushed twice for nine yards and caught both of his targets for 24 yards during Thursday's 21-17 win over the Jets. 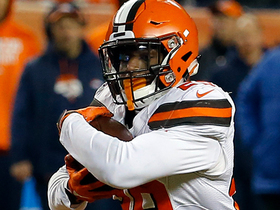 Analysis: Though head coach Hue Jackson said it was a priority to get Johnson more involved Week 3, that clearly fell to the wayside, as the dynamic running back played in just 38 percent of Cleveland's offensive snaps against the Jets. Over the first three games of the season, Johnson has just 15 total touches and five catches. The lack of involvement is starting to become a trend, leaving fantasy owners wondering if Johnson -- who caught 74 passes in 2017 -- is even worth a roster spot. Johnson rushed three times for three yards and caught both of his targets for seven yards during Sunday's 21-18 loss to the Saints. Analysis: It's been a slow start to the 2018 season for Johnson, who has just 11 total touches through the first two weeks. Johnson -- who signed a three-year extension totaling $15.6 million in June -- was expected to be a threat out of the backfield in both the running and passing game, though that has failed to come to fruition thus far. He'll look to get more involved Thursday against the Jets. Johnson carried the ball five times for 17 yards during Sunday's 21-21 draw versus the Steelers. 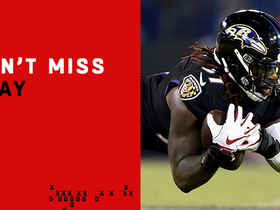 He also caught one pass (six targets) for eight yards. Analysis: Johnson wasn't the usual threat in the passing game that he's been in the past, though the rainy conditions and Tyrod Taylor's accuracy issues should weather the majority of the blame. Expect Johnson to play a bigger role in Week 2 against the Saints. Johnson won't play in Thursday's preseason finale against the Lions, Scott Petrak of the Elyria Chronicle-Telegram reports. Analysis: There's no injury in play here; Johnson is simply among many key players league-wide who will be rested in their team's preseason finales. Come Week 1, Johnson will reprise his change-of-pace duties with the Browns, an assignment that puts him firmly on the PPR radar. Johnson carried the ball three times for 13 yards with no targets during Thursday's preseason contest against the Eagles. Analysis: Johnson hasn't seen many snaps this preseason but has been productive when given the chance. It is, however, interesting to note that Johnson -- who's known as more of a receiver out of the backfield than a running back -- has yet to be targeted in the pass game this preseason. Don't expect that to be the case when the regular season kicks off though, as Johnson finished 2017 with 74 receptions on 93 targets. Johnson took four carries for 27 yards and didn't draw any targets in Friday's preseason game against the Bills. Johnson signed a three-year extension with the Browns on Thursday worth $15.6 million, Ian Rapoport of NFL Network reports. The Browns drafted Nick Chubb at No. 35 overall to join Johnson and Carlos Hyde in their backfield, Bud Shaw of The Cleveland Plain Dealer reports. Johnson is discussing a new contract with the Browns, NFL.com's Michael Silver reports. Johnson carried six times for 20 yards and a touchdown Sunday against the Steelers. He also caught all six of his targets for 75 yards and lost a fumble in the 28-24 loss. Johnson (shoulder) doesn't have an injury designation for Sunday's game in Pittsburgh, Nate Ulrich of the Akron Beacon Journal reports. Analysis: Like fellow running back Isaiah Crowell (shoulder/ribs), Johnson has yet to miss a game in his career. While he'll yield most of the carries to Crowell, per usual, this weekend, Johnson will remain active as a pass catcher due to his standing as the fourth-ranked RB in terms of receptions this season. Johnson (shoulder) was a limited participant in Wednesday's practice, Nate Ulrich of the Akron Beacon Journal reports. Analysis: Johnson was also limited at practice last Wednesday before returning to full participation Thursday and Friday. He had four carries for 20 yards and seven caches for 81 yards in a 20-3 loss to the Bears, accounting for 39 percent of Cleveland's yardage in a dismal performance. Johnson will now prepare to face a Pittsburgh defense that limited him to two catches for 20 yards (and zero carries) back in Week 1. Johnson rushed four times for 20 yards and brought in all seven of his targets for 81 yards in Sunday's 20-3 loss to the Bears. Analysis: The third-year back paced all pass catchers in receptions and receiving yardage on the afternoon, and his seven grabs also served as his second-highest total in that category this season. Johnson saw minimal work on the ground as usual, but his robust role in the passing attack has kept him a viable PPR option throughout the campaign. Now with a career-high 68 catches on his resume, he'll look to help the Browns avoid a winless season when they face the Steelers in Week 17. Johnson (shoulder) practiced fully Thursday, Scott Petrak of the Elyria Chronicle-Telegram reports. Analysis: Johnson will be fine for Sunday's game against the Bears and as usual is worth a look in most PPR formats, as well as deeper standard leagues, while working in a time-share with early-down back Isaiah Crowell. Through 14 games, Johnson has only hit the 10-carry mark once, back in Week 9. In that span, however, he's snagged a total 61 passes for 537 yards and has logged six TDs overall. Johnson (shoulder) was a limited participant in Wednesday's practice, Mary Kay Cabot of Cleveland.com reports. Analysis: Johnson was bothered by his shoulder at points in September and November, but it didn't cost him any games or seem to impact his workload. He'll likely be fine for a tough Week 16 matchup against a Chicago defense that's held running backs to 4.1 yards per carry and 5.4 yards per target. Johnson rushed seven times for 23 yards and a touchdown and added five receptions (seven targets) for 40 yards during Sunday's 27-10 loss to the Ravens. He also lost a fumble. 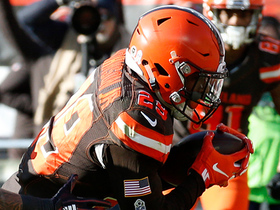 Analysis: Usually the second fiddle to Isaiah Crowell, Johnson actually out-carried his teammate for the first time in 2017. Thanks to a 59-yard run in the second quarter, Crowell had more success on the ground than Johnson, but it was the latter who found the end zone for the second straight week. Per usual, Johnson was heavily involved in the passing game, and has nine receptions on 11 targets for 81 yards over his last two contests. Johnson took six carries for eight yards and caught all four of his targets for 41 yards and a touchdown in Sunday's 27-21 overtime loss to the Packers. Johnson rushed seven times for two yards and caught two of four targets for 10 yards during Sunday's 19-10 loss to the Chargers. Analysis: While Isaiah Crowell found success on the ground in the tune of 4.1 yards per carry, it was a different story for Johnson. He couldn't find any room to run, and his 12 total yards were a season low. The third-year back is usually heavily involved in the passing attack, but with Josh Gordon's return, targets were hard to come by, and Johnson had to settle for just four passes thrown his way. The 24-year-old will look to get more involved against a suspect defense in the Packers next week. Johnson rushed six times for 35 yards and hauled in four of five targets for 32 yards during Sunday's 30-16 loss to Cincinnati. Browns run game coordinator Kirby Wilson said he wants Johnson on the field as much as possible because the team believes so strongly in the running back's playmaking skills, Nate Ulrich of the Akron Beacon Journal reports. Johnson (shoulder) isn't listed on the Browns' injury report ahead of Sunday's game against the Bengals. Analysis: Johnson apparently only suffered a very minor injury in Sunday's 19-7 loss to the Jaguars. Isaiah Crowell also is dealing with a shoulder injury and was limited at Wednesday's practice, but he managed to play through it last week and likely intends to do the same against Cincinnati. Johnson has enjoyed two of his better games the past two weeks, combining for 156 scrimmage yards, 10 receptions and a touchdown. He previously had three straight games with less than 75 yards and no touchdowns. 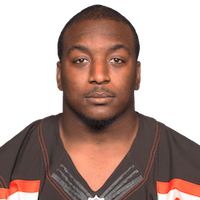 Head coach Hue Jackson said Johnson aggravated his shoulder injury during Sunday's 19-7 defeat to the Jaguars, Nate Ulrich of the Akron Beacon Journal reports. Analysis: Johnson tended to a shoulder injury in preparation for Week 4 but was ultimately cleared by the release of the final injury report. In the intervening period, he's racked up 40 carries for 196 yards, 35 catches (on 36 targets) for 254 yards and three total touchdowns across seven games. His activity level in practice this week will relay whether he's in danger of missing any time. Johnson carried the ball 10 times for 54 yards and snagged a team-high six passes on six targets for 34 yards during Sunday's 38-24 loss to the Lions. Analysis: Sunday marked the first time in 2017 in which Johnson was given double-digit carries and the third-year back out of Miami made the most of it. He averaged 5.4 yards per carry and also paced the team with six receptions. Johnson's 16 total touches were a season high as well. The 24-year-old has accumulated 44 rushes and 42 receptions on the year, and more work is likely if his production continues to trend upward. Johnson (head) isn't listed on the Browns' Wednesday injury report, Nate Ulrich of the Akron Beacon Journal reports. Analysis: Johnson was briefly removed from a 33-16 loss to the Vikings in Week 8 to be evaluated for a concussion, but he passed all tests conducted during the contest. With the Browns coming out of a bye week, Johnson should handle his usual role splitting snaps and touches out of the backfield with Isaiah Crowell. The Lions are heavily favored in the contest, which should work in Johnson's favor when it comes to the workload division. Cleveland Browns running back Duke Johnson extends the play on 21-yard catch. 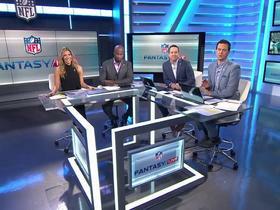 The "NFL Fantasy Live" crew discuss players who had disappointing Week 13 fantasy performances. 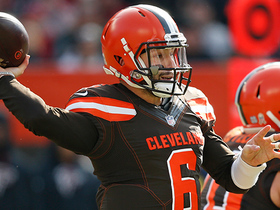 Cleveland Browns quarterback Baker Mayfield finds running back Duke Johnson for a 23-yard gain. Cleveland Browns running back Duke Johnson's pump fake to Nick Chubb almost gets first down. The "NFL Fantasy Live" crew discusses the lessons learned from Week 9, including which players we can trust.